If you’ve never danced, then now is the time to learn. The Program of Dance and Movement holds its ninth annual inspireDANCE Festival in an eight-day event beginning Thursday, February 14, on the University’s River Campus. Festival passes are available for purchase at the Common Market at Wilson Commons or online at rochester.universitytickets.com. For information, visit the inspireDance Festival website or call 585-273-5150. The festival features more than 30 master classes and styles of dance, including flamenco, contemporary, ballroom, Pilates, capoeira, West African dance, ballet, peacebuilding, and injury prevention. The traditional first day welcomes high school students from Rochester-area schools, including the School of the Arts and Aquinas Institute, who take part in a day of dance and instruction. There will be a free inspireDance kick-off concert of student performances at 8 p.m. Friday, February 15, in Spurrier Dance Studio. The world-renowned David Dorfman Dance—a company known for its radically humanistic, innovative, and inclusive movement-based performance—will give a lecture and performance at 8 p.m. Monday, February 18. In a first-time collaboration with Nazareth College, the New York City–based company will also perform “Aroundtown” at the Nazareth College Arts Center on Thursday, February 21. Guest artists also include Heidi Latsky, Jerron Herman, and Greg Youdan, who will take part in an artist talk and live performance on “Creative Body/Healing Mind,” Saturday, February 16. 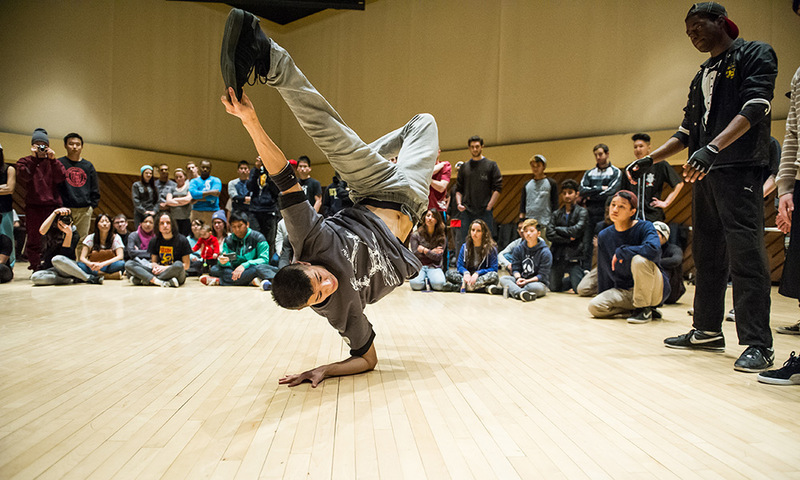 The ninth annual inspireJAM—a hip hop battle with dance crews from around New York and Pennsylvania—takes place on Sunday, February 17. The inspireDANCE Festival is the brainchild of Arielle Friedlander ’10, who was a participant in Rochester’s e5 program (formerly KEY, or Kauffman Entrepreneurial Year), which provides students with an additional, fifth year to carry out an entrepreneurial venture. The festival is a means for students involved in dance and movement to connect with each other and to the Rochester-area dance community.